Seriously high levels of excitement as I’ve just picked up a bike from Lind Motorrad in Norwich to do some more Sausage King Adventures on. 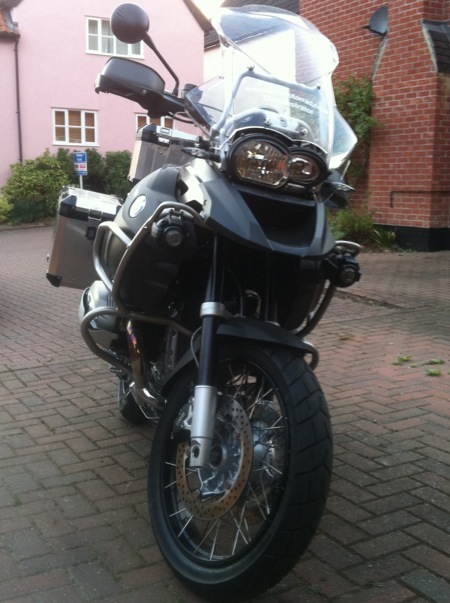 It’s a BMW R1200 GS Adventure as used on The Long Way Down which regular readers will know was part of the inspiration for The Sausage King Adventures. To describe how I feel as excited is a serious understatement! This is possibly the ultimate bike for Sausage King Adventures. The 33 litre fuel tank means that I can go further before I have to fill up, probably 300-400 miles. The panniers offer more than enough space for sausage samples collected on my travels and the all weather design of the bike means I can search for sausages in all weathers. BMW have been making the GS series of dual purpose (on-road, off-road) motorcycles since the 1980s and I cannot wait to experience the thrill of a classic piece of German engineering. Like the UK, Germany is a Nation of Sausage lovers and I can’t wait to ride this classic BMW from England to Berlin to visit to the Currywurst museum. Already the reaction to the bike has been awesome, people are very interested to find out more about it. Over the next few weeks I will write more here about my adventures on this bike.